When it comes to bringing a dish to a pot-luck, I always get stuck on what to bring. It’s important to me that we bring a healthy dish, since you never know what type of foods will be served at the party. I’ve been to my fair share of gatherings where my dish was the only vegetable on the table! Whatever we bring MUST be budget-friendly, since our budget isn’t very big to begin with. Plus with warmer weather approaching, there’s bound to be more outdoor parties, and the cost of bringing pricey dishes to each party can add up quickly. Food safety also concerns me, and I don’t want to assume the host has space in the fridge for my dish, so I prefer to bring something that can be served at room temperature. No heating or cooling required, plus no chance of forgetting that my dish was in the freezer! Finally, the dish should be something I can make using ingredients I already have in the house. This way, I’m not tempted to make any last minute trips to the store for convenience-type foods. This seems to be what usually happens when we get a last-minute invite to an impromptu BBQ party, but those foods are over-priced and full of additives and preservatives making them far from healthy! This short list seems like a tall order, which is why I struggled for a really long time to come up with a solution! 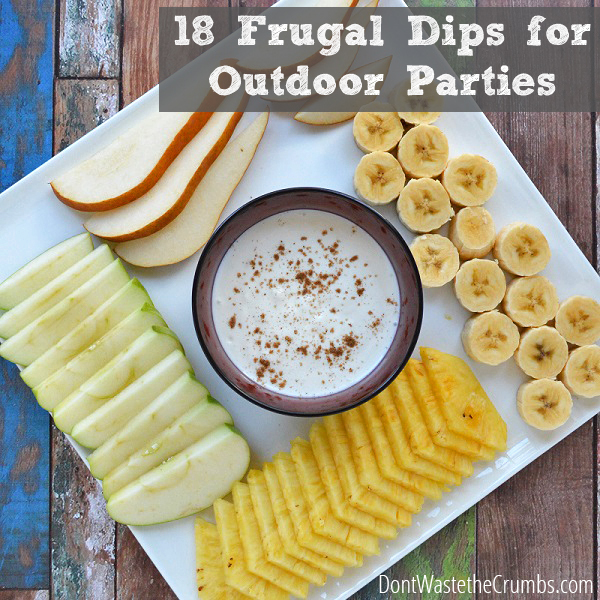 Then one day it hit me: Bring a healthy and delicious frugal dip! Everyone loves a delicious dip, and they’re the one sure-fire way you can ensure fruits and vegetables will get eaten, especially when it comes to kids. Even if there is a HUGE mound of dip on a carrot, they’re still eating a carrot! The best part about dips is that you can create one using the ingredients you already have in your kitchen. This goes for both the dip AND the dippers! Start by taking stock of what you have in the kitchen to serve with your dip. Lots of carrots? Plenty of apples? A little bit of several items? Got a few minutes to make some crackers? Then browse the appropriate dip category to match-up a recipe with your dippers. 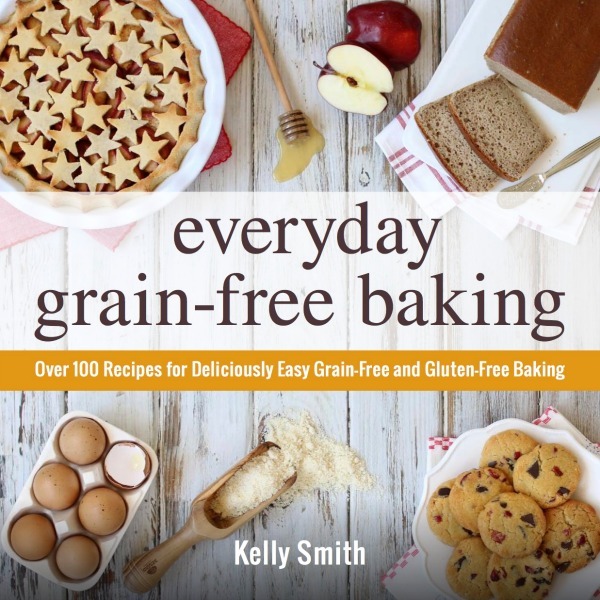 Browse the ingredients of the recipe to ensure you have everything needed. Substitute ingredients as needed using the “money saving ideas” at the end of this post. Use this method the next time you’re invited to a party, and save time and money without sacrificing nutrition! Great fruits for dipping: Apple slices, banana chunks, blueberries, cantaloupe, peeled clementines, grapes, honeydew, kiwi, mango, peaches, pears, pineapple or strawberries. Fruits that are prone to browning (i.e. apples, bananas, pears, etc.) can be tossed with lemon juice to maintain their pretty appearance. Great veggies for dipping: Asparagus, broccoli, bean pods, bell pepper, carrots, cauliflower, celery, cucumber, radish, tomatoes and zucchini. Here are a few gluten-free/grain-free cracker options that are delicious with any of the above dips! Beans: If you have time, make beans from scratch instead of buying canned beans. Your savings is 70¢ per can. If you don’t have garbanzo beans on hand, use white beans instead. The taste will be only slightly different, yet it will still be healthy and delicious! Citrus: Bottled citrus juice (lemon or lime) is a fine substitute for fresh citrus juice if you don’t have the fruit. The opposite switch works too if you have the fruit, but not the juice. If you need lemon juice, but only have lime, make the switch! The slight flavor difference is hardly noticeable in most dishes. Cream: Heavy cream can often be substituted with half & half in a 1:1 ratio. If the dip is thick, cut back on another liquid to maintain consistency. If you don’t have half & half, try thinning 1/4 cup sour cream with 1-2 Tbsp milk. Garlic: Fresh garlic is interchangeable for powdered garlic, and the opposite is true as well. Substitute 1 tsp of garlic powder for 1 garlic clove, minced or crushed. Mayonnaise: Sour cream, Greek yogurt and mayonnaise are often interchangeable in recipes. Use what you have on-hand and add a bit of lemon juice, if the dip needs more tang. Mustard: All mustards can be used interchangeably: brown, yellow, deli, honey or spicy. The recipe will change slightly in flavor, but you’ll still get that signature mustard tang. Oils: If you don’t have an oil but have the seed (ex: you have sesame seeds but no tahini, or flax seeds but no flax seed oil), add 1 Tbsp of the seed to the recipe with 1/2 tsp olive oil and blend as usual. Another option is to substitute olive oil for the oil called for in the recipe. Finally, don’t feel pressured to bring a certain amount of any one particular vegetable, or even the typical dipping veggie. Often, having a mixed/matched variety is the most appealing! 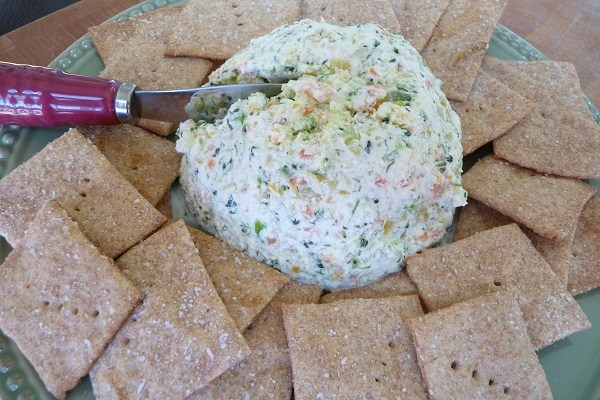 What’s your favorite dip to bring to parties? 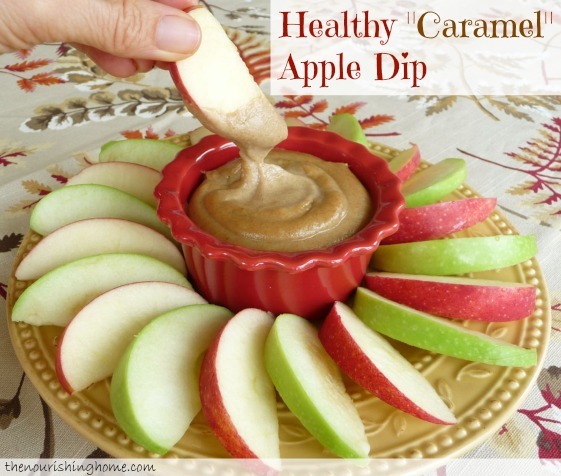 Do you prefer a sweet dessert dip with fruit, or a savory dip with veggies? Share your ideas in the comments below. Note from Kelly: Don’t miss all of the other great budgeting posts that Tiffany has shared here. Simply click here and keep scrolling through to see her many helpful posts on how to save money on your food budget. Thank you for so many great ideas! With summer coming I am excited to try some of these out for alfresco lunches with my son! Thanks so much, Kristin! I remember those 90-degree summers in FL, when the only dip I wanted was one in the pool. LOL! Love to you, sweet sister!